The main opposition Republican People's Party (CHP) and the right-wing Good Party (İP) Friday agreed on the functions and details of their election alliance for the municipal elections slated for March 31. CHP Chairman Kemal Kılıçdaroğlu and İP Chairwoman Meral Akşener met Friday at İP headquarters in the capital Ankara to review the problems that the parties have been confronting in several provinces and districts. Following the meeting, the full list of mayoral candidates for the upcoming elections was declared to the public. According to the agreement, the two parties agreed to cooperate in 49 provinces, 22 of which are metropolitan municipalities. The İP will back CHP's candidates in 12 metropolitan and 16 provinces, the CHP, on the other hand, will not field its mayoral candidates in 10 metropolitan and 11 provinces in support of İP's candidates. Speaking to reporters after the bilateral meeting, the leaders announced that the alliance talks run by the delegations have been completed. They also added that the scheme of the cooperation has also become clear. As a result of long negotiations, the CHP and İP, the two main components of the Nation Alliance, agreed in early December to cooperate in 21 provinces, but later expanded their alliance to 15 more provinces for the upcoming local elections. According to the previous agreement, the İP will support the candidates of the CHP in three of the most populous and accordingly significant provinces of Turkey - Ankara, Istanbul and İzmir. Also, within the framework of the final agreement, the CHP will not field a candidate in 21 provinces, including Manisa, Balıkesir, Denizli, Samsun, Trabzon and Kayseri, while the İP will back the CHP's contenders in 28 provinces, including Aydın, Muğla, Tekirdağ, Adana, Eskişehir, Antalya and Bursa. Previously the CHP and İP could not agree on Istanbul, Izmir, Ankara's Etimesgut, Muğla's Bodrum, Denizli's Pamukkale, Kocaeli's Çayırova and Bursa's Osmangazi districts. 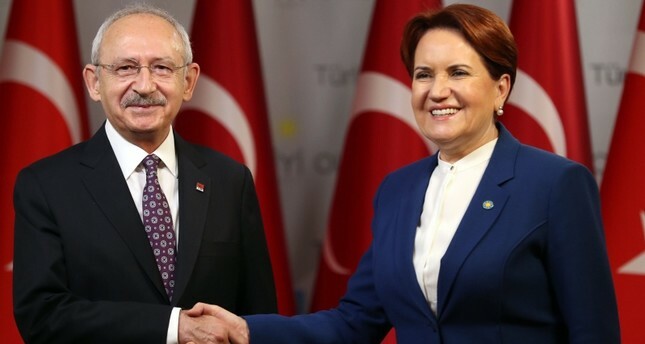 Subsequently, Kılıçdaroğlu and Akşener spoke on the phone on Jan. 20 to discuss the disagreements regarding some districts of Istanbul and western Izmir. Accordingly, both parties will compete in the elections with their own candidate in the Etimesgut district of Ankara, while the CHP will not offer a candidate in the Gölbaşı district of the capital in favor of İP's candidate. Furthermore, in Turkey's southeastern Gaziantep province, the CHP will also support the İP's candidate. The parties also agreed to present their own candidates in southwestern Muğla's Bodrum. In Istanbul, while the CHP will not offer a candidate in four districts in support of İP's candidates, the İP will support CHP's candidate in 25 districts of Istanbul. For the remaining 10 districts, the two parties will compete in the elections with their own candidates. In detail, even if the İP was willing to nominate a candidate in Üsküdar, where Akşener resides, the CHP would present the former member of the conservative Felicity Party (SP), Mehmet Bekaroğlu, as the parties' joint candidate. Also, after the resignation of the former mayor of Istanbul's Şişli district, Mustafa Sarıgül, from the CHP on Wednesday, former CHP deputy Çetin Soysal is expected to be nominated in the district. In Izmir, even though there are only three months left for the vote and the six-party caucus meetings have passed, the CHP has not yet revealed a mayoral candidate for its stronghold, İzmir province. However, the party is expected to officially announce İzmir's Seferihisar district Mayor Tunç Soyer as its İzmir candidate on Jan. 27. The two parties have been signaling that they will continue the Nation Alliance formed in last year's June 24 presidential and parliamentary elections with the SP and center-right Democrat Party (DP) in order to appeal to the other parties' voter bases in the local elections. The alliance, though, suffered a defeat in the elections, receiving 33.9 percent of the votes.